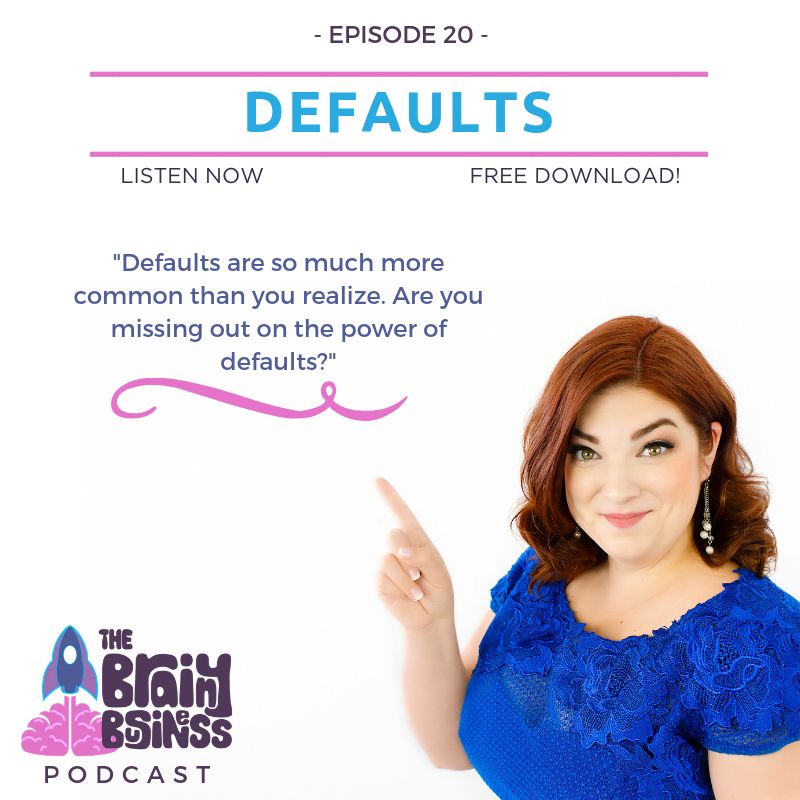 This behavioral economics foundations podcast episode is about defaults. Today’s episode on defaults is going to absolutely blow your mind. You may think you know how defaults work, but you will not believe how they impact you, your business, and really everything. It’s amazing. You probably don’t realize it, but defaults are everywhere. Basically, every choice has a default. Think of the default as what happens if you do nothing – or if your customer does nothing. More often than not, when presented with a series of options people will go with the default. Listen in to learn how critical it is to consider the default option, complexities of choice architecture, and more. [16:44] You probably think you already know all you need to know about defaults, but I’m going to blow your mind today. [17:26] Every choice has a default. Doing nothing is a default. People often go with the default, and this is connected to status quo bias. [18:32] People are more likely to keep things the way they are – maintaining the status quo and not take an action to change things. [18:56] In business when you are presenting options it is CRITICAL that you consider what is the default and what will be more likely to be chosen. [19:09] This is getting into Choice Architecture, which will be the focus of a series of episodes as it is very complex – I had a whole class dedicated to the topic of Choice Architecture in my master’s program. [19:37] Defaults are the way our brains really showcase just how lazy they are. This is where all the “should’s” of the world come to die. [20:41] An example of default retirement savings. Options 1 and 2 leave defaults that are consistent with past behavior instead of considering the future. [23:29] Option 3 is have people commit when they are in a cold state to commit some of their future earnings to retirement. This is an easy commitment for the brain to make because of time discounting. People are also less likely to opt out than they would be to opt in. [24:27] 78% of people opted to use this program when it was offered to them and 80% were still in the program after 3 pay raises. Average investment rates nearly tripled! [25:33] This is a really creative solution that could be applied in many other areas to help people to have better lives. [26:04] Too many programs and approaches are trying to get people to change their natural tendencies. [26:26] When push comes to shove the subconscious is the one making the decisions. [26:53] You can’t tell your subconscious to not be subject to defaults and status quo bias. [27:37] An example of defaults and how they impact you. This one comes from Kahneman’s Thinking, Fast and Slow. [28:35] If you make a bet and come up wrong, but everyone else did too, you are much less likely to be ridiculed than if you went against the herd and made a losing bet no one else made? [31:15] If people make a choice and step away from the status quo (the doing nothing) and lose…they feel increased regret. [32:02] In your business, is it the default for your customers to do business with you? Or are you asking them to change their behavior to buy? [32:40] Consider subscription services to anything in the world. The act of turning off the auto-renewal or canceling the subscription would require taking an action. [34:37] Setting up automatic payments for mortgages, insurance and auto loans are defaults that benefit everyone. [35:20] Make it easy for people to opt out if they want to. [36:02] Most people will not put in the effort to cancel, but you want to make it so they don’t WANT to cancel. [36:17] What sort of service can you provide that includes a regular, automatic payment to you as the default? Is there a way to make buying from you the default? [37:58] Most people use the default settings on their computers. It’s better to be able to go with the recommendations of the people who built the thing. They know how it works best and if anything doesn’t suit your style you can always change it, right? [42:18] A badly placed default can make people want to get out of everything and completely change their habits. [43:01] The ethics of choice and defaults. There is a lot of debate in behavioral economics about the right way to use defaults and choice architecture. [43:12] Is it our responsibility to help people with a well-placed default? [43:45] You want to make it so people still have a choice. Make sure people aren’t harmed if they go with the default and give them the option to choose something else. [44:31] Add in some sensible defaults if you have a complicated product or service. Most people will choose a pre-selected option. [45:00] What is presented first is also more likely to be chosen. [45:19] People now need to make a choice to opt into overdraft protection. This goes against the status quo bias and most people won’t do it even though it is in their best interest. [46:18] How do you choose what is best for most people? [46:57] 95% of people support organ donation but only 43% are signed up as donors. You have to opt-in to be a donor and that is why there is such a small sign up percentage. [48:31] For your business, remember that you have many defaults impacting your customers and how they interact with you. [50:51] When you look at your business, how can you use defaults to benefit your company and your customers? [52:22] Next week on episode 21 we are going to talk about one of the concepts I hinted at in this episode – habitual buying.